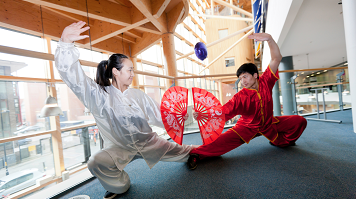 London South Bank University’s (LSBU) Confucius Institute for Traditional Chinese Medicine is holding a series of events across London to celebrate the Chinese New Year, also known as ‘Spring Festival’. Festivities usually begin on the day before the New Year and continue until the Lantern Festival, which falls on the 15th day of the New Year. “London’s Chinese New Year celebrations are some of the most spectacular in the west, with over 300,000 people taking part. “It’s become an integral part of London’s annual event calendar. It’s wonderful to see people from so many different communities and diverse cultures coming together to ring in the New Year and share our wishes for a lucky and prosperous future. “LSBU is well-known for celebrating culture diversity, and the Confucius Institute plays a prominent role in promoting Chinese language, culture and traditions at the University, as well as in the local community. We’re hosting several multi-cultural events throughout the festive period, including an east-meets-west bake-off at the University’s National Bakery School, with dumpling and bread-making demonstrations. The Confucius Institute for Traditional Chinese Medicine is run as a partnership between LSBU and two China-based institutions, Harbin Normal University and Heilongjiang University of Chinese Medicine. As well as teaching Chinese language and culture, the Institute has a strong focus on Traditional Chinese Medicine. The Institute delivers a programme of Chinese language and culture lessons in 44 schools across London. In 2014, it was the first in the UK to be awarded 'model Confucius Institute' status by China's Vice-Premier, Liu Yandong. To find out more, visit the LSBU Confucius Institute website.